Firma Melodiya presents a recording of Alfred Schnittke’s Symphony No.1, one of the conceptual masterpieces of domestic music from the late 20th century. Schnittke, an outstanding master of Russian music avant-garde, composed the symphony between 1969 to 1972. The composer’s first large-scale orchestral piece made an epoch in history of symphonic music in general, combining for the first time the traditions with radical innovation, a two-century branch of the evolution of the symphonic genre with an ultimately modern musical language through the techniques of dodecaphony, aleatoric music, polystylistic devices, jazz improvisation and the so-called instrumental theatre. The young composer was under a strong impression of the symphonies by the European avant-gardists Luigi Nono and Luciano Berio, and also Bernardo Bertolucci’s 1900 (Novecento). Schnittke’s Symphony No.1 is tied with invisible artistic threads to Dmitri Shostakovich’s last symphony (No.15), finished in 1971. However, it was the piece where the composer gained his genuine individuality - his music now was truly recognizable. A piece like this could not be performed freely under the Soviet circumstances of the time, with its ideological censorship. It was premiered in 1974 in the city of Gorky (now Nizhny Novgorod) that was closed for foreign visitors. A year later it was performed in Tallinn, and the Moscow premiere took place as late as 1986. 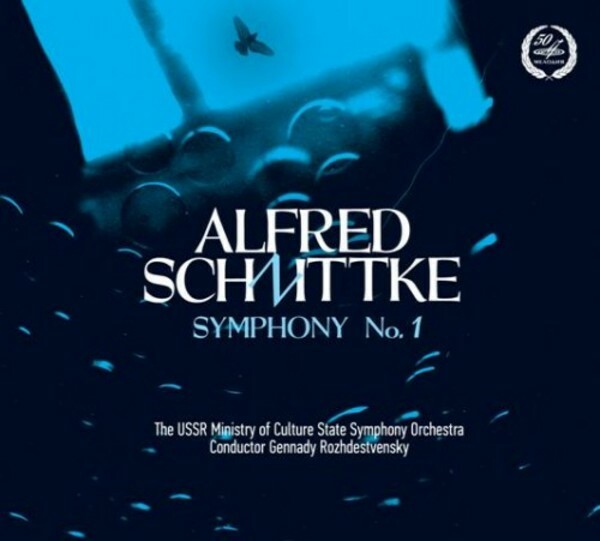 The symphony was dedicated to its first performer and outstanding conductor Gennady Rozhdestvensky who was an ardent advocate of Schnittke’s music and also initiated its recording. That recording is featured in the release (recorded 1987).